Monitor earthquakes globally or at up to 10 custom locations. For each location you choose to monitor, you set the cutoff magnitude and radius. Browse earthquakes in the past 24 hours or past 30 days in map mode or feed mode. Use the slider to quickly filter earthquakes by magnitude. 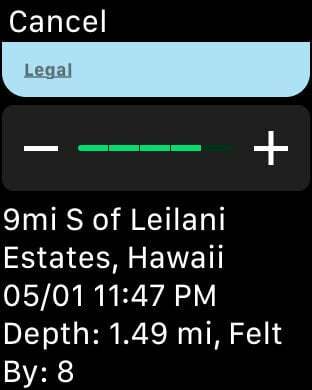 Set a custom location in feed mode to find the closest recent earthquakes to that location. Tap on a earthquake to show more details including depth and felt-by numbers. Drilling into a specific earthquake also reveals options to jump to the USGS event webpage with a separate option to plot cities near the epicenter with their populations. - A Today View Widget for quick access to earthquakes in the past hour. Tap an earthquake from this table to jump to its specific page in the app. 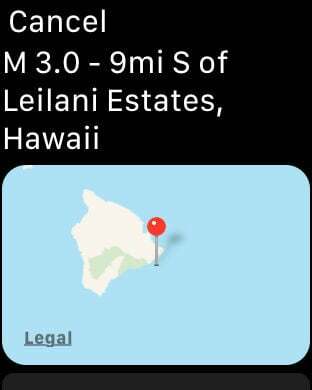 - Detailed earthquake notifications with a built-in epicenter map on iOS and watchOS. 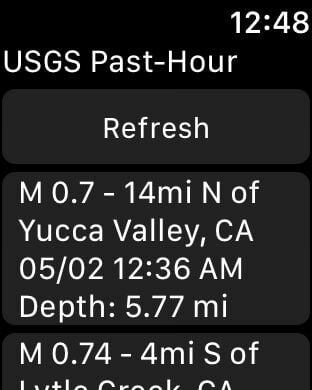 - A watchOS app for access to the past hour of earthquakes, including zoomable maps, felt by numbers, and depths. - 3D touch the app icon to bypass the main app menu in convenient ways. Please read the App Help File and FAQ for more specific usage information. All data is from the USGS (United States Geological Survey). There is a fixed banner ad from Google on the bottom of most of the screens.